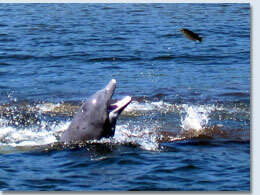 Our Crystal River dolphin tours are $125.00 for two people and $50 for each additional person. We do not put more than 6 people on a boat to keep trips a little more private and personal for everyone. Our dolphin trip lasts approximately 2 hours. You will see dolphins on this trip as well as many other different types of wildlife such as beautiful bird life, ospreys, bald eagles, pelicans, cormorants and of course manatees and raccoons. You may also see turtles, apple snails, and blue crabs while we travel by in the boat. There are different types of turtles in Citrus County. Also known as “cooter”, they are the river cooter, common cooter, Florida red-bellied cooter and the Suwannee cooter. We also have large Tarpon that weigh up to 125 pounds that you can see and hand feed right from the dock at Pete’s Pier. There is also a chance of seeing deer or wild pigs while passing by. We also have a family of Bald eagles that fly around our area, which is quite breathe taking to see. For our Dolphin cruises we create waves in the back of the boat where you will be able to watch the Dolphins play around and jump in the most beautiful way possible. Bottlenose dolphin are blue-gray in color with lighter shading along their flanks and belly. The diet for dolphins is a wide range of common fish like herring and mackerel or even eels and squid. 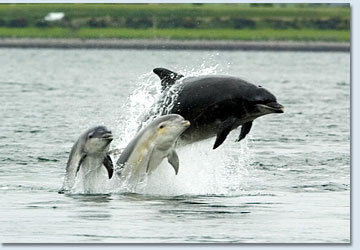 Dolphins are social animals and like to be in both small and large groups which are called pod . Some of the threats that are facing dolphins and their habitat at risk range from commercial fishing and individual propeller strikes to oil spills that affect the whole ecology of the region. The Dolphins are such beautiful animals to watch there is nothing more beautiful than riding down the river watching these animals feed and play in the back of the boat while being able to see the other wild life Crystal River has to offer. We can schedule Dolphin tours any time that would work best for you. This is a trip that will keep you wanting more after it’s over! To book a Crystal River Dolphin Cruise, call us direct at 352 445-5489.